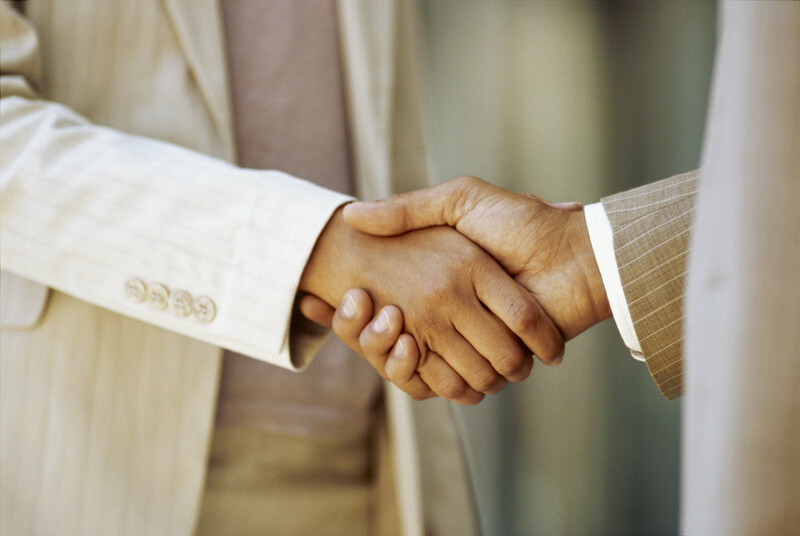 More than just physical contact, a handshake conveys a wealth of psychological information. We walk away from a handshake saying things like, “You know, I just felt really comfortable with her” or “I don’t know why, but I simply don’t trust that guy”. Most people don’t spend time probing the depths of this unconscious communication; they just have a ‘feeling’ or a sense that their intuition is telling them something. However, there are things we can use in our sales effort by looking a little more closely at the experience. 1. Sweaty Palms – When a person is nervous their sympathetic nervous system often becomes overactive, sometimes resulting in sweaty palms. Do what you can to put this individual at ease. 2. Dead Fish– Indifferent handshakes that feel like the person has no bones in their hand often indicate a passive or reserved personality. This handshake ranks as the number two least favoured. Individuals with this type of clasp are generally not people-focused. Knowing this, you can tailor your conversation to de-emphasize the people aspect and focus more on the mechanical or thing focused benefits. 3. Brush off – This handshake type is a quick grasp and then a release that feels like your hand being shoved aside. This handshake is a statement of ‘it’s my turf and my agenda that matters, yours doesn’t’. Listen first to what the person wants before talking about your ideas for them. 4 Controller– You feel your hand being pulled toward the person or strongly guided in a different direction, perhaps towards a chair. People who do this are controllers. This means they want to dominate any inanimate or animate object in the room ( and that would include you). If your goals are different to theirs there may be challenges ahead. Do more listening than talking and see if you can find common ground so these individuals can control the situation toward your desired objective. 5. Politician– Your hand is firmly grasped as in a normal handshake. However, their other hand may cover yours or be placed on your forearm or shoulder. Unless the two of you are good friends, this is a form of false sincerity. The person is attempting to communicate that the two of you have a deeper relationship than you actually have. After receiving this kind of handshake, I recommend you check your pockets or purse to see if anything is missing. Similarly, be cautious about relying on this person’s word for anything and be attentive in your dealings with them. As in any sales situation, the more you know about your prospects and clients, the better you can communicate with them. So create a strong first impression by being aware of your own handshake and understand the hidden messages in your clients. For professional, Impartial advice & Solutions contact me at Janette Whitney & Associates on 01403 733671 .Award Winning Business Consultants & Business Growth Specialists.